This year the dancefloor is at the heart of the camp. It is defined by the dome, parts of the wall in which the DJ booth (made dust proof by Belle and Tejawe) is set and a bunch of zero-gravity chairs. The chairs and two 10' x 10' platforms can be moved easily. 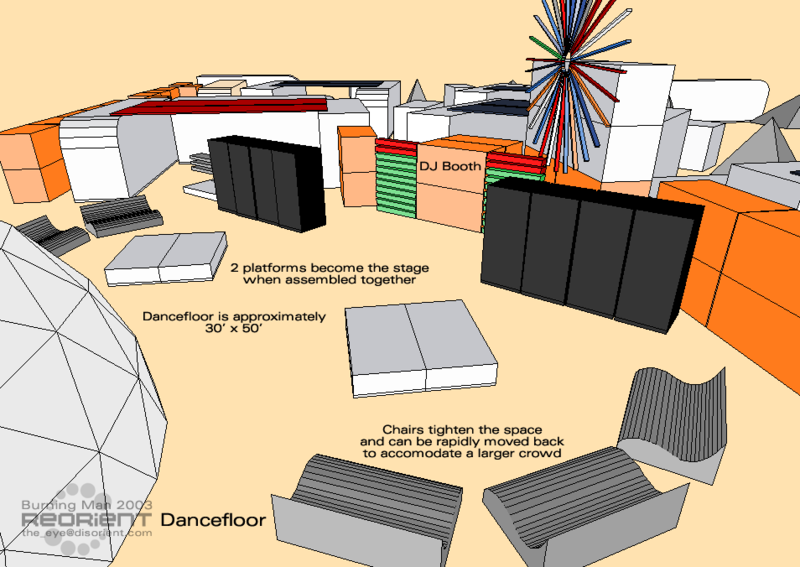 The platforms will be reconfigured for live shows into a 20' x 10' stage that fits between the two stacks of speakers and the DJ booth. The chairs will help constrict and expand the space according to the amount of people dancing. Check out Reorient's calendar for DJ line-up and events. Voice your ideas in the music/parties SIG. Volunteer to help build the zero-gravity chairs and the wall.